The 2018 election cycle was truly one for the history books. Over the course of the last two years, the grassroots built a nationwide movement that helped Democrats win big, and our cycle review takes a close look at all the small-dollar fundraising that made it happen. —Approach fundraising from several different channels. Running ads on Facebook and Twitter can give your content the boost it needs to reach more folks. But keep in mind: The vast majority of online contributions come in via email. Giving Tuesday is a great opportunity to get more folks in the door and on your email list through paid ads on social media. That way you’ll have a bigger list to reach out to for the rest of giving season and the new year. 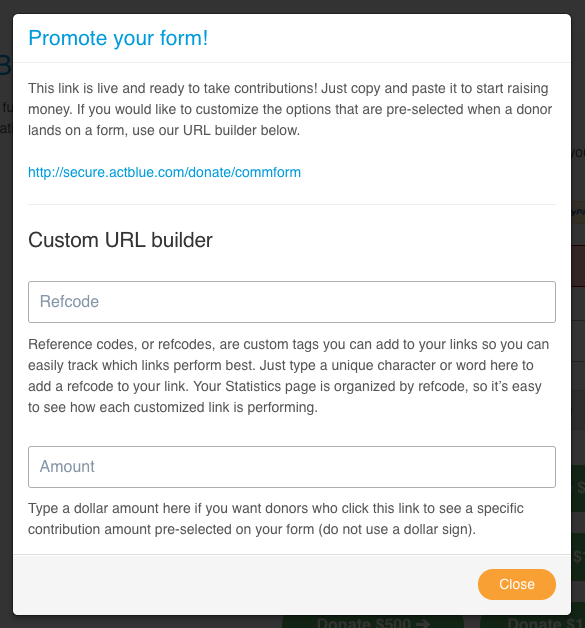 —Add a pop-up to your website asking for a donation. Use this space to provide a quick and compelling reason why you’re fundraising during giving season. That way folks heading to your website can give on the pop-up quickly and easily without even having to search around your homepage for a donate button. —Customize your contribution form… Every contribution form on AB Charities comes automatically mobile-optimized and rigorously tested to get you the highest conversion rates possible. You can take your form one step further by adding specific text and making a special Giving Tuesday branding, so people feel like they’re part of your organization’s big giving day. —…and your social share settings. We frequently hear from donors who are extremely proud of their donations and excited to share that they’ve chipped in, which is why we’ve built social share features right into AB Charities contribution forms. With so many people talking about giving online on Giving Tuesday, it’s absolutely crucial that you add social share content for the big day. You want to put your best foot forward if supporters are sharing links to your contribution forms. —Move your supporters up the ladder of engagement by asking them to help you raise money. Folks who are *already* engaged and supporting you can make an ask of their own personal networks on behalf of your work! Folks who care about your work can provide a new, personal perspective to fundraising asks and make a big difference in helping you hit your goals. With AB Charities it’s easy for your community of supporters to make their own fundraising pages. —Make recurring asks to keep folks engaged and fueling your work throughout the year to come. Recurring contributions are a great way to capture the excitement of giving season and turn it into long-term success. With AB Charities, you can set a deadline at the end of the year so donors can contribute a small amount each week from Giving Tuesday on, or you can set recurring contributions to run indefinitely every month, so you can keep the momentum going into the new year. —Use remarketing on your contribution forms. Enable remarketing on your AB Charities contribution forms and donors who abandon your form before completing it will automatically receive an email thirty minutes following their incomplete donation. This can make a huge difference in maximizing the amount of money you can bring in from a single ask. —Be sure to thank donors and think about ways to follow up and keep them engaged! With AB Charities you can customize the ‘thank you’ text on the automated receipts your donors will get after they’ve contributed. That personal touch can keep the connection going with your supporters and encourage them to come back and give again. These are just some of the many creative ways you can maximize the money you’re raising this giving season. If you want to talk through your own ideas or ask our nonprofit team about any of the strategies shared here, we’re happy to chat. Reach out at support@actblue.com. EOQ can be a stressful time for emailers, but there’s nothing quite like the feeling you get after clicking the big red send button on a fundraising email and watching your fundraising total climb towards your goal. You can make that moment even more exciting by bringing what we call a “pinger” sound into the mix! Just head to your group’s Overview on your Dashboard and scroll all the way to the bottom. You’ll see a blue bar across the page and a dropdown like the one you see below. 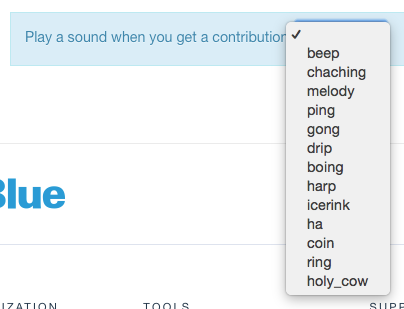 You can choose any sound from the dropdown menu and then if you leave the page up, the sound you’ve chosen will play each time your group receives a donation. 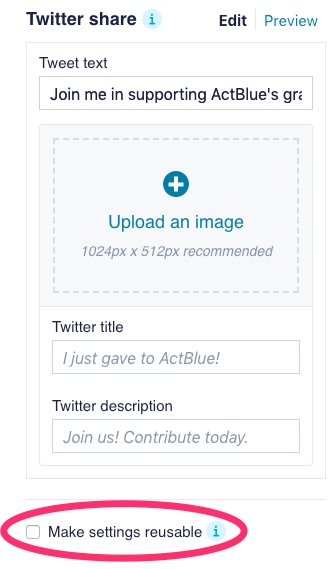 And any group on ActBlue can take advantage of this feature! Even more fun? Our team has the ability to create new sounds on the fly (as we have the time and capacity), so if you have suggestions, you should let us know! Email us at support@actblue.com or find us on Twitter and let us know your idea (@actblue). To turn off a pinger sound that you selected in the dropdown, simply refresh your Dashboard. To stop a custom pinger sound that you added via a URL parameter, delete everything after “dashboard/” in your Dashboard’s URL. We hope this provides you with an extra jolt of excitement every time someone chips in to support your work. Happy Fundraising! We’re seven weeks out from Election Day! It’s crunch time, especially for ActBlue admins who are trying to hit their campaign fundraising goals in the run-up to Election Day. And honestly, it’s the busiest crunch time we’ve ever seen. 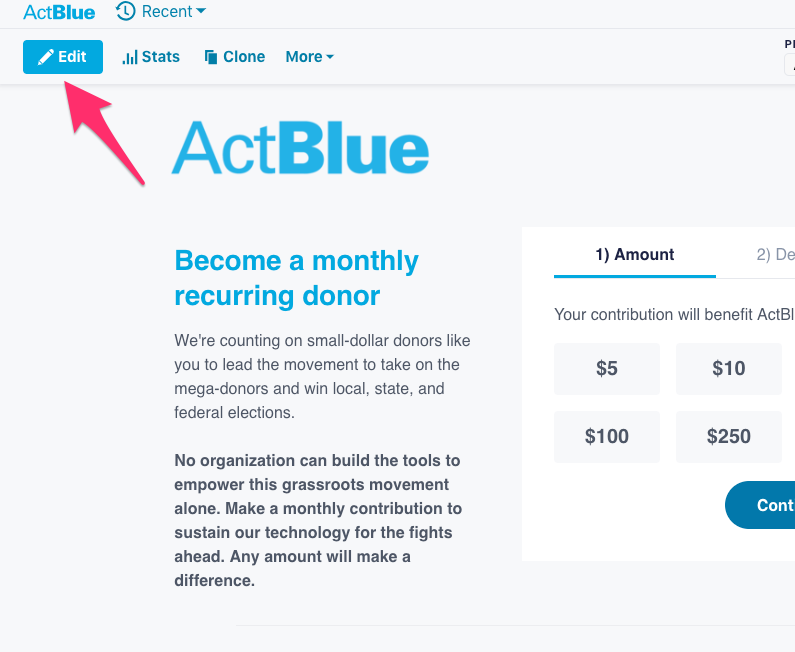 The good news is there’s an ActBlue feature that can help fundraisers out a lot during this final push: weekly recurring. It’s a great tool that helps campaigns and committees bring in more donations during these crucial weeks when the pressure is really on. Just as it sounds, weekly recurring gives donors the option to sign up and make a recurring contribution that processes on the same day of the week, every week, until November 6th. After Election Day, the recurring contribution automatically ends. Asking donors for weekly recurring contributions is a great way to build on the connection you’ve already made in the final weeks before the polls open. You should take this opportunity to let your donors know just how much their contributions will make a difference seven, six, or five weeks out from Election Day. Let them know how you’ll be spending the money and what their contributions could mean for the results of your race. Get them excited about helping you out through Election Day and make them feel like a part of your movement! There are two important things to note about weekly recurring contributions: Someone from our team will need to enable the feature on one of your group’s contribution forms. And we can only turn weekly recurring on for your forms if you’re using ActBlue to fundraise for both your emails and website. So if a donor signed up for a recurring contribution on Tuesday, September 25th, they’d be making seven contributions, one scheduled to process each Tuesday (including Election Day). If you’re interested in turning on weekly recurring, shoot us an email at support@actblue.com with the forms you want it turned on for. If you decide to expand your weekly asks and you want to use it on more forms before Election Day, you can just clone a form that already has weekly enabled. Don’t forget that you can use pop-up recurring asks for weekly contributions! But make sure you change the ask language and note that it’s a weekly recurring contribution. One weekly recurring test we had great success with was our ‘7 for 7’ ask, where we asked donors to give $7 for the last 7 weeks before the election. But it’s important to remember that every list is different. 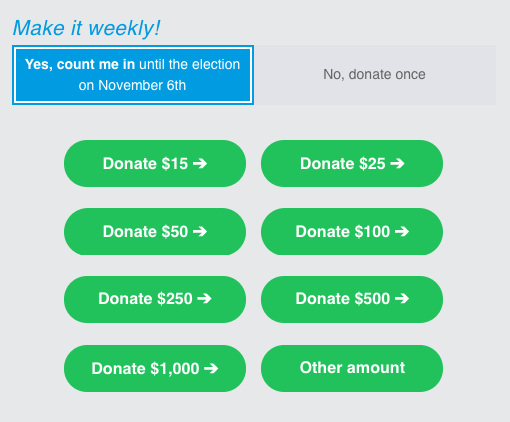 Weekly recurring is a great way to keep your donor base engaged right up until Election Day. We’re thrilled to bring you this option again and would love to hear about any tests you run that are particularly successful. Are you ready to get set up with weekly recurring? Let us know at support@actblue.com and we’ll turn it on for you. We frequently hear from donors who are extremely proud of their donations and excited to share that they’ve chipped in, which is why we’ve built social share features right into our contribution forms. It’s easy to add images or text to your forms that will be included with your link every time someone shares it on Twitter or Facebook. 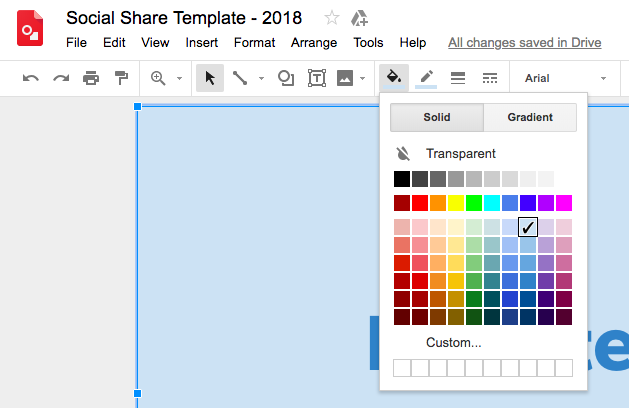 And now we’ve built a brand-new, easy-to-use template for folks to use to create their own social share images to add to their contribution forms. Keep reading for all the details. What does social share look like? Every time someone shares a link to your contribution form on social media they’ll be sharing a relevant image along with the link to donate. 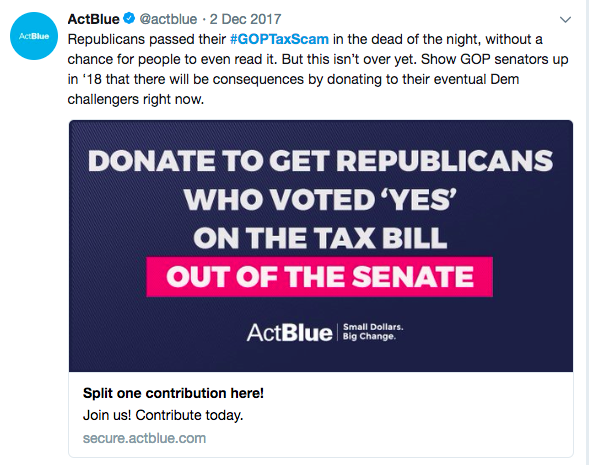 In the example above, we were tweeting out a form where folks could donate to Democratic nominee funds — funds we built at ActBlue to raise money for the Democrats who win primaries and go on to challenge Republicans in general elections. The social share graphic we included was attention-grabbing and helped explain a slightly wonky topic. That’s the kind of thing that can make a big difference when sharing forms this way. Photos can add a human touch to your campaign or cause and catch the eye of people scrolling through their social media feeds. That’s why campaign photos are often a great choice for social share images. You’ll find our brand new social share graphic template here. 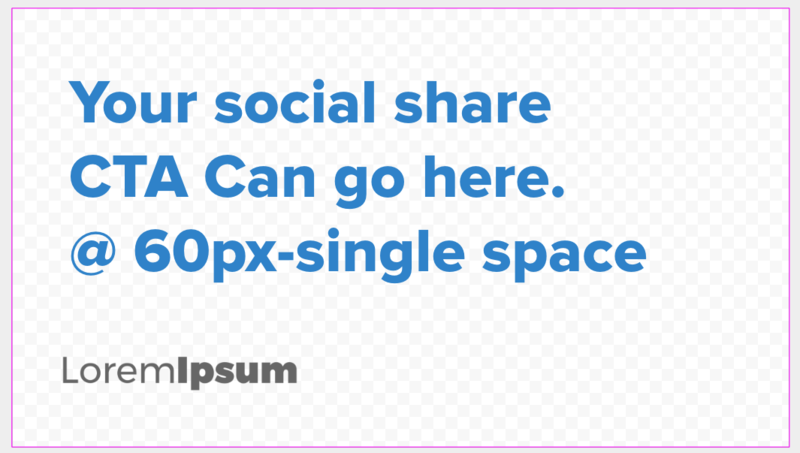 The center area where you should put design elements you want displayed on your social share graphic is 1000 x 525 pixels (with a 2:1 ratio) — specs that will fit the standard Facebook and Twitter image sizes for sharing links. You can make changes to the text on the template by adding in your own copy and changing the font and color of the text to fit your brand. You can also add images and logos, and/or change the background color of your graphic. To replace the sample text on the template just highlight the text and begin typing. To upload a logo or an image to the template, just select the Image box within the top menu and upload your image. You can replace the LoremIpsum logo with your own, like you can see in the example below. But you should also remember that this is just a template! Feel free to move things around within the template to make sure your graphic best fits your brand. 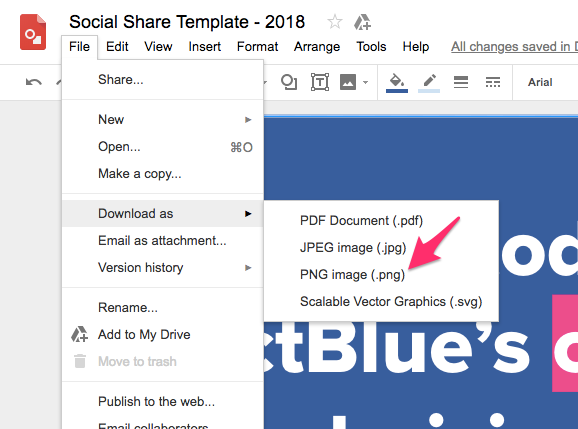 After you’ve got your images and text in place, you can also change the background of your social share image, by using the bucket tool in the top menu. Now that you’ve got the bones of your design, you can add some style to your text if you’d like. You can easily add some depth to your design simply by highlighting some of your text, as you can see in the gif below. Feeling good about your design? Now you just need to download it! Note that you shouldn’t change the size of your image before downloading. Just head up to the top menu and choose the File dropdown menu. Then you’ll want to choose “Download as…” and download the image as a PNG file. Once you’ve downloaded your image there’s one final step you should take to make sure your image will display in clear, high quality. Due to Twitter and Facebook’s image compression process, sometimes images will appear blurry on social shares. If your image is looking a little blurry, you can try this tool. Just drag your image into the box on the page. This will tweak your image so that it will bypass Twitter and Facebook’s compression tools (but won’t change the way your image looks). Once you’ve dragged your image on to the page, a new version will download to your computer and will include “TWITSAFE” in the file name. This will work for both Twitter and Facebook. 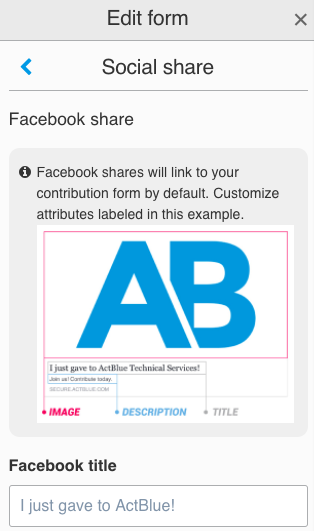 So, how do you set up your shiny, newly designed social share image on a contribution form? It’s easy! Once you’ve created a contribution form, select the “Edit” button, the first button on the contribution form navigation bar (form navbar). Next, you’ll want to choose “Social share” from the form editor. Here you’ll be able to customize the title and description of your links as they’ll appear on both Facebook and Twitter. You can also include your campaign or organization’s Twitter handle if you’d like to be tagged every time someone shares your form. Below you can see just what you can change for your links on Facebook and Twitter. Lastly, you’ll be able to upload your new, custom image using the “Upload an image” option which you can see below. You can also save these social share settings to easily reuse them for any future form by checking off the “Make settings reusable” option at the bottom of the “Social share” tab. To double check that your image and text look how you want them to, head to https://cards-dev.twitter.com/validator and drop the link to your form in the Card URL box. It will show you a preview of what folks on Twitter will see in their feeds. You can do the same for Facebook at this link: https://developers.facebook.com/tools/debug/. Social share can make all the difference in social media fundraising, which is why we’ve made it so easy to build right into your fundraising program. 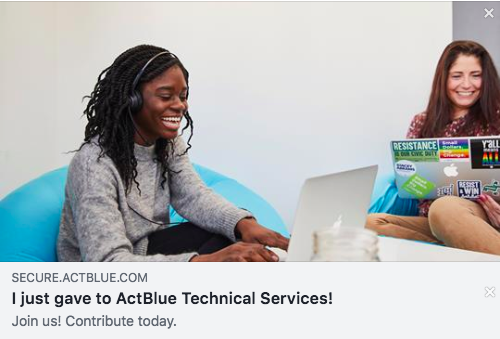 If you’re a donor or activist creating contribution forms for causes you care about and you have questions about social share, you can reach out at info@actblue.com. 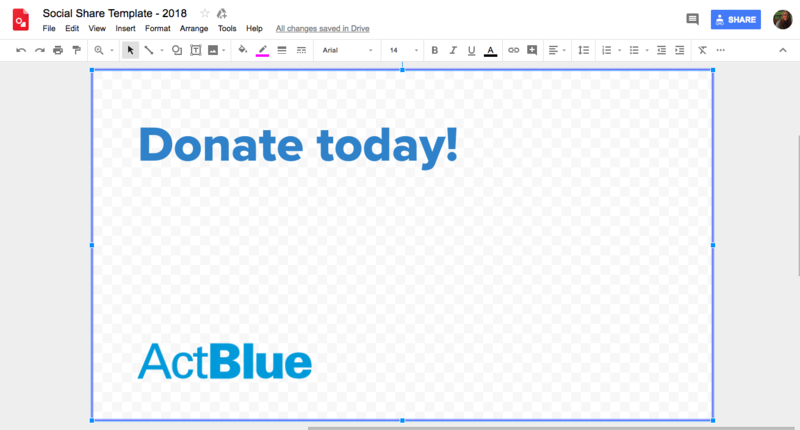 And if you’re working for a campaign or organization using ActBlue and you have questions or comments about creating social share graphics using our template, or customizing your social share text, just drop us a line at support@actblue.com! We’re seeing more energy and participation right now from small-dollar donors than we ever have before. It’s amazing. But even more amazing is that we’re seeing donors taking matters into their own hands — they’re not just donating to campaigns and organizations when they’re asked, they’re organizing and connecting with their communities to raise money for campaigns and causes they care about. How exactly are they doing this? They’re creating community forms on ActBlue — forms that are not created by a campaign or organization, but by members of their community of supporters. 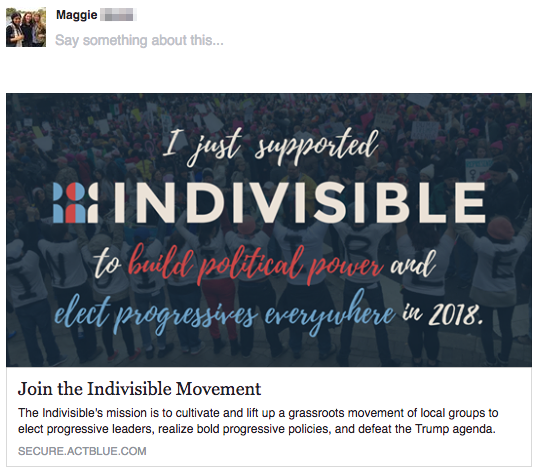 They’re raising money for individual campaigns and organizations, and they’re creating forms where folks can give to lists of candidates supporting legislation they’re passionate about, or lists of nonprofits doing critical work on the ground in our communities. And they’re raising millions for campaigns and organizations on ActBlue! Creating forms is an easy way to take your activism one step further. And it’s free to do using ActBlue’s tools! That’s why we wanted to walk you through creating community forms and raising money from your friends, families, and extended networks. Keep reading for all the info you need to create your own forms and get fundraising! 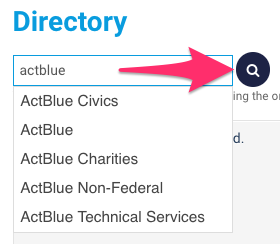 If you’ve used ActBlue before you’ll want to get started by logging in to your account here. If you’ve never made an account with us before, you can create an account here. Once you’re all logged in, you’ll want to select the My Fundraising tab. Type the name of the candidate or organization you want to fundraise for in the search box. You must click the blue magnifying glass button to see the correct results, not the names that appear in the dropdown. You can also find groups by selecting one of the links in the gray box. At this point, you’ll be brought to a list of groups, with options (in orange) to create a community form to fundraise for each of them. Once you’ve found the group you want to fundraise for, click the group’s “Create contribution form” button to start making your community form. A pop-up will open where you can fill out your form’s basic information. First, give your form a title. You’ll be able to edit your form’s title later, so don’t worry if it’s not perfect. Then finish the web address for your form by typing a short, simple, memorable word in the “Web address” box, which will be part of the unique web address for your form. Pick a short word or phrase and make a note of it so you can locate your form easily at a later time. When you click “Create and continue,” you will be taken to a live preview of your form and you’ll see the form editor open on the left. 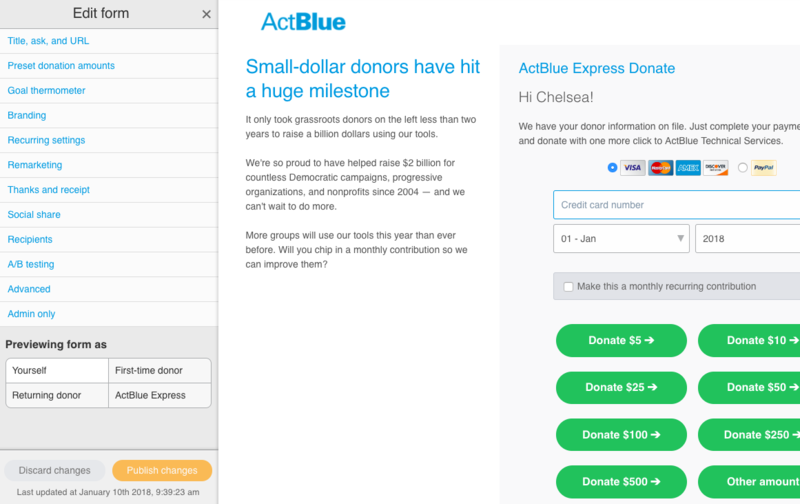 One way to make a big impact by fundraising on ActBlue is to raise for a group of candidates or organizations doing work you care about via Tandem Fundraising (using one single form). For example, you can add all the candidates who are running against Republicans who take money from the NRA, or you can add multiple organizations working on the immigration fight to support their efforts to reunite families. It’s easy to add more than one group to your form! Just head to the “Recipients” tab of the form editor, where you can easily add different campaigns or organizations. 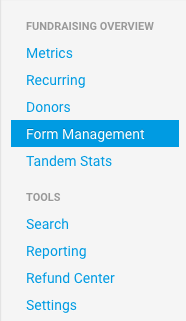 When a donor lands on a Tandem Form, they can then split one contribution between all of the groups listed on the form. You can add basic formatting, like bullet points and bolding, and images to your ask. Another great feature in the form editor that we encourage folks to take advantage of is social share. This lets you customize the content that will be shared on a donor’s Facebook and Twitter account when they choose to share that they’ve made a contribution on social media. It’s a simple way to catch the eye of potential supporters! 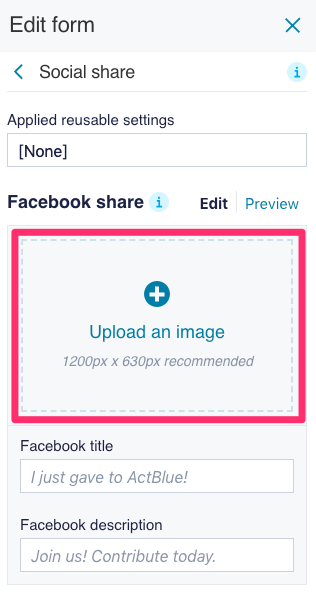 To do this, open the “Social share” tab in the form editor and then fill in the fields. It can be difficult to raise money via social media, since folks are often scrolling quickly through their feeds and aren’t super likely to actually stop, read a fundraising pitch, and click out of Facebook or Twitter to donate. Social share can grab people’s attention and help motivate them to donate, so we encourage customizing your social share text and/or image if you can. We also have a handy social share image template available for folks to use to create simple graphics to include in their social share. You can find it here: https://docs.google.com/drawings/u/1/d/1qEILgxbIBFr5Sjgpx3a9S9Uxl7DU7dDat5EksOF1Pzo/copy. After publishing all of your changes, close the form editor and head to the “Promote” button to start sharing your form! To send your form out to the world, just copy the link that’s generated on the top of the Promote pop-up and paste it in an email, a social media post, or anywhere else you’d like to fundraise. There are lots of further customizations that can be made to contribution forms, but we wanted to highlight the basic, easy ways to get started with fundraising to help folks get the ball rolling. You can also do things like set your form to accept recurring contributions for a specified length of time or choose specific contribution amount buttons to be displayed on your page. You can also add a goal thermometer and customize the text your supporters will receive after they donate. 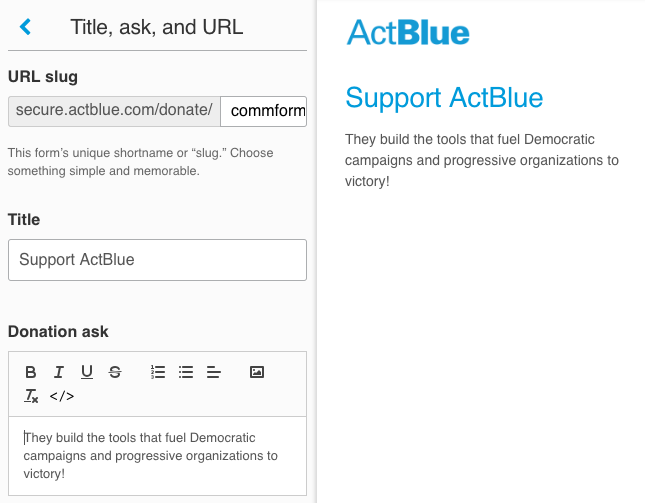 We’re always happy to help folks take advantage of our tools and organize their networks, so if you have questions about building forms feel free to reach out to our team at info@actblue.com. You can also find even more detailed instructions on our support site. And if you’re seeing success using ActBlue forms to fundraise from your community, we’d love to hear about your work. Drop us a line at info@actblue.com or tweet at us @actblue to tell us about it! It’s always been our mission to help people have an impact on the issues and causes they care about. When it’s easy for small-dollar donors to hop on their phones or computers and chip in what they can, they contribute more frequently and truly feel invested in the movements they’re supporting. Another important factor that influences whether or not donors ultimately decide to give? They want to trust the platform and the donation process. And that includes having a good sense of what happens with their money after they click that donate button. We know that when donors chip in to support critical work, they expect the donations they’re making to get to the groups they’re supporting ASAP. They want to help groups hit their goals and be successful. It’d be a real shame for the money they give to sit for weeks or even months before being put to work, but that’s the reality with some fundraising platforms. In 2017 alone, there were over 7,800 groups using our platform — from charities raising money for disaster relief to diaper banks in communities across the country. These are all groups doing critical work, and it’s important for them to have quick access to the money they’re raising. Not only does this help organizations do their best work, but it helps donors know that their contributions are going to make a real difference in the work they care about. So how does this play out day-to-day? Think back to the many natural disasters Americans had to face last year. They needed funds and supplies quickly in order to begin recovering after hurricanes and wildfires. Millions of folks stepped up to help out and chipped in online to do their part. We were able to send checks right away, so organizations in the affected communities could put the funds right into relief efforts when they needed it most. When groups raise small-dollar donations on AB Charities, we send them a check with the money you’ve chipped in every week without fail. Whether it’s a holiday or the middle of a snowstorm, we print checks and get them mailed out to organizations every Monday. We’re also available at a moment’s notice if nonprofits are in a pinch and need their money quicker than usual. We can overnight a check or wire money directly to a group’s bank account, at no additional cost. Long story short? If you’re working for a nonprofit, you can rest assured that the donations you’re raising on our platform will get to you quickly. And if you’re a donor chipping in what you can to support work you believe in, know that your donations will be put to work and making a difference in no time. 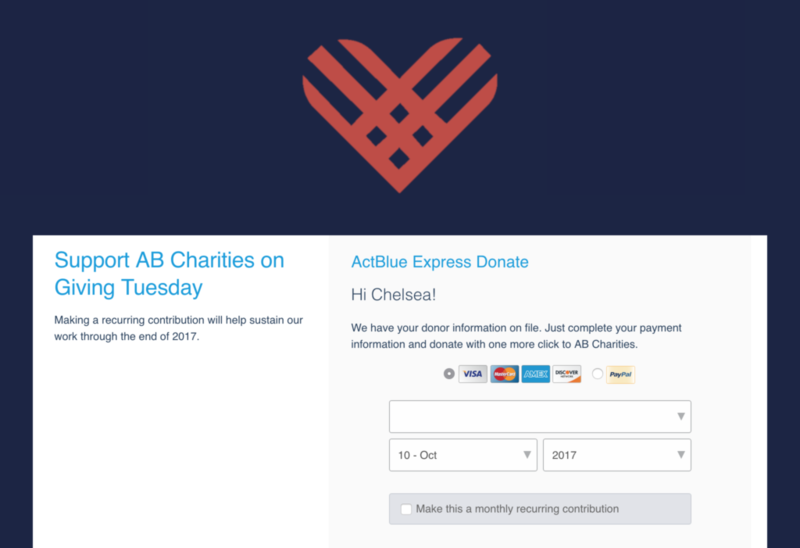 If you have questions about using AB Charities to raise money, or want to learn more, just drop us a line at support@actblue.com. In order to run an effective fundraising program, we know it’s essential for organizations to have access to their donor and contribution data where and when they need it. That’s why we’re excited to announce that we’ve just rolled out an integration with Salesforce! If you’re using AB Charities to fundraise but using Salesforce as your CRM, you’ll now be able to sync data across both platforms in real time. And it’s free! Salesforce is a leader in the nonprofit space and we’re very excited we could build this integration. 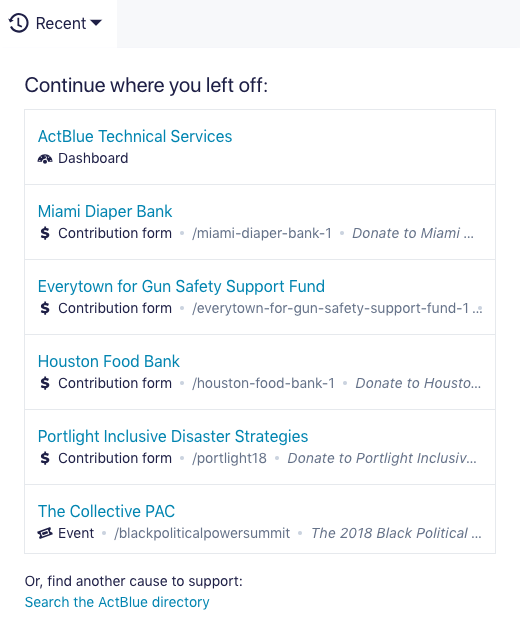 Now folks using their tools and ActBlue will have access to all the details of a contribution (like whether it was recurring, the amount, and the refcode), as well as donor info including email addresses within Salesforce, all in real time. Using this new integration will help nonprofit organizations run data-driven fundraising programs and build workflows that are best for their budget and their goals. If you’re interested in setting up a Salesforce integration with AB Charities, or have any questions about this new feature, you can email us at support@actblue.com. For those organizations that might be using other CRMs, we offer integrations with several other platforms, and we offer open webhooks. These can provide more flexibility in the way your organization retrieves and works with your data. If your organization wants to hear more about using webhooks, you should reach out to our team and we can provide you with the details. And we’re happy to continue integrating with new platforms — if there’s a specific integration you’re interested in, please get in touch with us! Big news: We totally overhauled the way you edit contribution forms! Why? 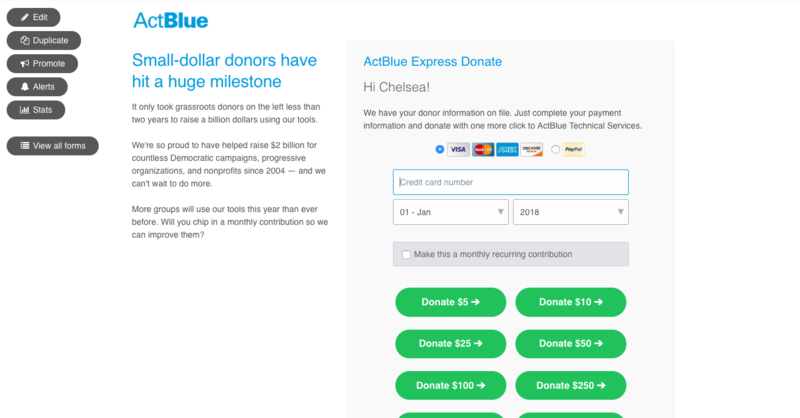 Creating contribution forms is the most central part of using ActBlue to raise money from small-dollar donors. The new contribution form editor is a more streamlined, user-friendly way to make changes to your forms. Now you can preview any edits you make in real-time, so you can test out what adding a branding or more text looks like. 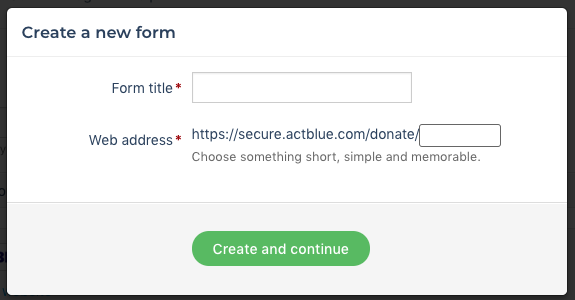 You can also view your form as different types of ActBlue users, so you can get a clear picture of what your form will look like for donors who land there. But rest assured that even though you can see your form changing as you make updates, your edits won’t be visible publicly until you save them. You’ll see a form menu on the left with options allowing you to edit your form, duplicate it, or visit the form’s Stats page where you can track donations for the form. You can also set contribution alerts for the form, add refcodes and build links using the Promote function, or head back to a list of all your contribution forms. As you make edits, you’ll see an orange dot appear next to the item that you updated. When you finish making edits, you’ll need to click “Publish changes” at the bottom of the editor menu to make them live. The form editor will be time-stamped so you know exactly when your last changes were made and saved. If there are unpublished changes you’ll see an orange dot indicating that some edits haven’t been saved. If you click off of a section but have unsaved edits, you’ll see the orange dot next to the section title in the editor, to help you keep track. This way you can make multiple changes across sections in the editor, and when you click “Publish changes” all of those edits will go into effect. If you make a change and try to close out the editor before clicking “Publish changes,” you’ll see a pop-up prompting you to either save your edits or close the editor and discard them. If you’ve made changes and decide you don’t want to publish them, you can click “Discard changes” at the bottom of the editor. 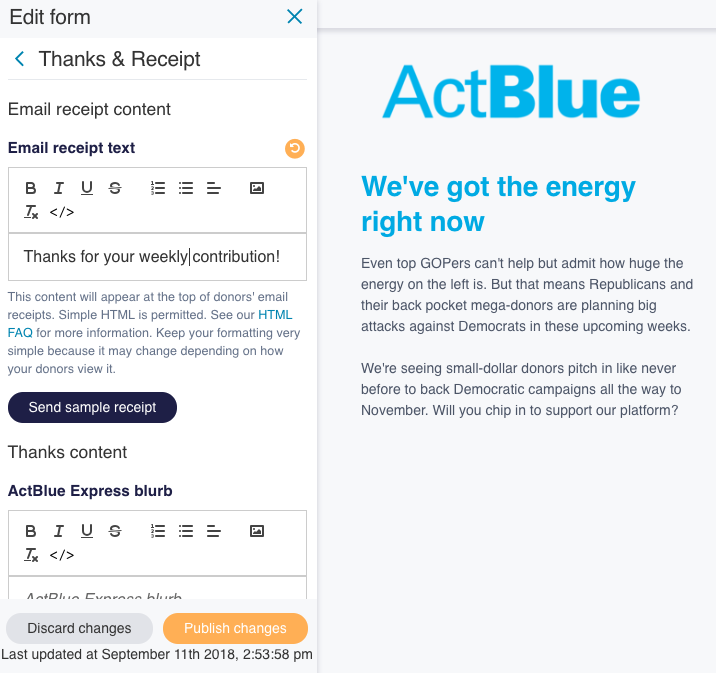 One of the biggest changes we made in this update is giving you the ability to view the form as different types of users — a first-time donor, a returning donor, or an ActBlue Express donor. At the bottom of your form editor menu, you’ll find buttons for these three options. Toggle between them to see the different views, and click “Yourself” to go back to viewing the form as you normally would. As for accessing all of your forms, you’ll still do that in the Form Management tab on your Dashboard, or within the form menu on any contribution form. We hope these changes will make the form editing process easier than ever. Please don’t hesitate to reach out at info@actblue.com if you’ve got questions or comments.